One of the more destructive cyclones to emerge from the northern hemisphere 2002 summer storm season was Typhoon Sinlaku. 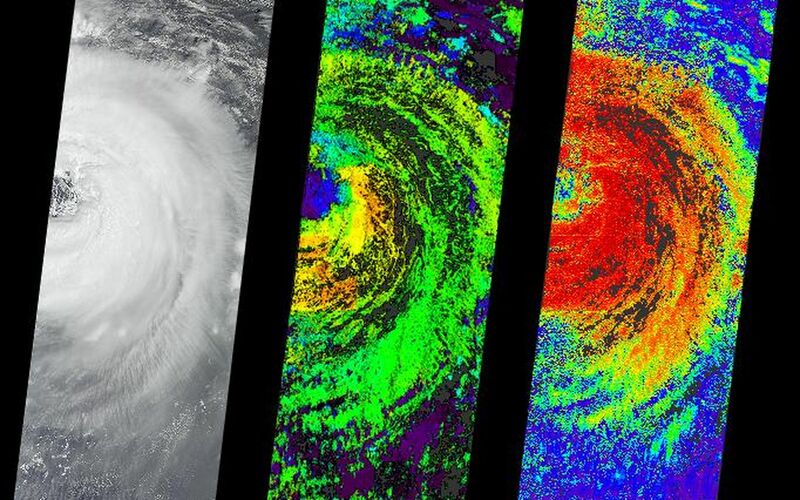 Several attributes of this storm event are portrayed in these data products from the Multi-angle Imaging SpectroRadiometer. 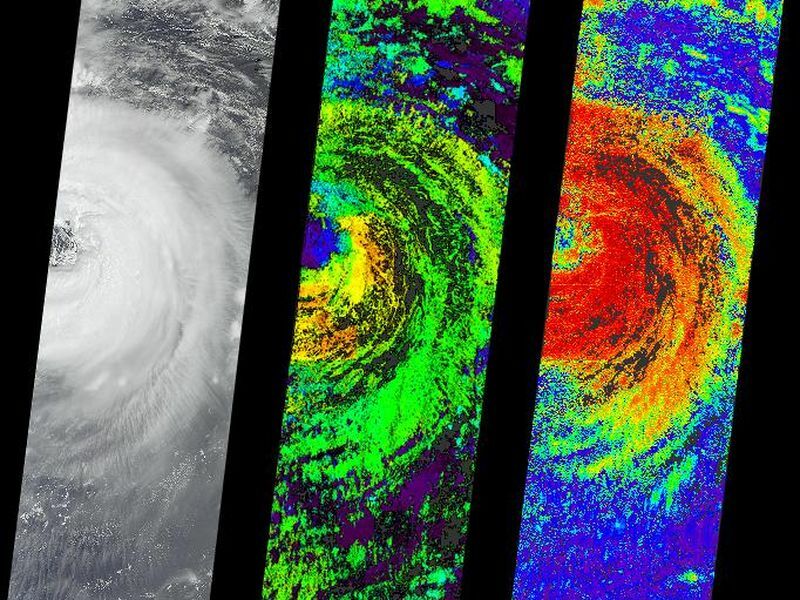 The images were acquired on September 5, when the western portion of the storm was situated over the Okinawan island chain. Over the next few days it moved west-northwest, sweeping over Taiwan before making landfall along China's Zhejian province on the 7th. The typhoon forced hundreds of thousands of people from their homes, caused major power outages, and at least 26 people were reported dead or missing before the storm weakened as it moved inland. While the nature and formation of individual storm events is relatively well understood, the influence of clouds on climate is difficult to assess due to the variable nature of cloud cover at various altitudes. MISR's data products are designed to help understand these influences. 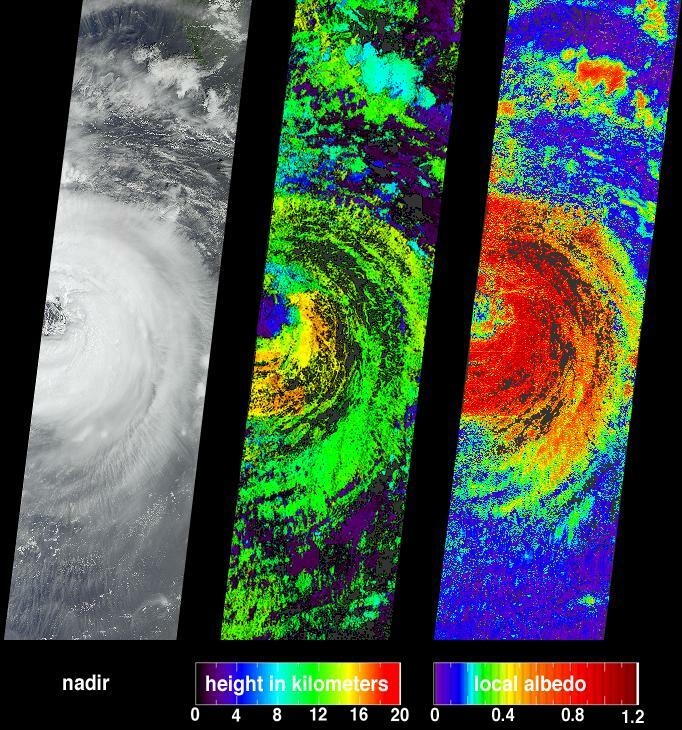 Typhoon Sinlaku is shown at left as a natural-color view observed by MISR's vertical-viewing (nadir) camera. The center panel shows the cloud-top height field derived using automated stereoscopic processing of data from multiple MISR cameras. Relative height variations, such as the clearing within the storm's eye, are well represented. Areas where heights could not be retrieved are shown in dark gray. Clouds have a significant influence on the global radiation balance of the Earth's atmosphere, and the improvement of climate models requires more accurate information on how different types of clouds influence Earth's energy budget. One measure of this influence is albedo, which is the amount of sunlight reflected back to space divided by amount of incident sunlight. Bright objects have high albedo. Retrieved local albedo values for Typhoon Sinlaku are shown at right. Generation of this product is dependent on observed cloud radiances as a function of viewing angle and the cloud height field. Over the short distances (2.2 kilometers) that MISR's local albedo product is generated, values can be greater than 1.0 due to the contributions from the sides of the clouds. Areas where albedo could not be retrieved are shown in dark gray. 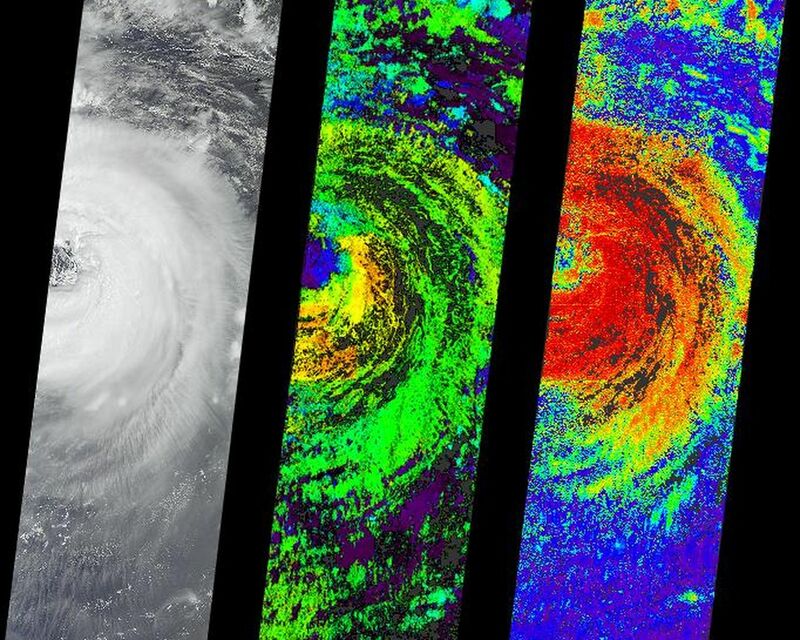 The Multi-angle Imaging SpectroRadiometer observes the daylit Earth continuously from pole to pole, and views almost the entire globe every 9 days. This image is a portion of the data acquired during Terra orbit 14442, and covers an area of about 380 kilometers x 1408 kilometers. It utilizes data from blocks 65 to 74 within World Reference System-2 path 113.